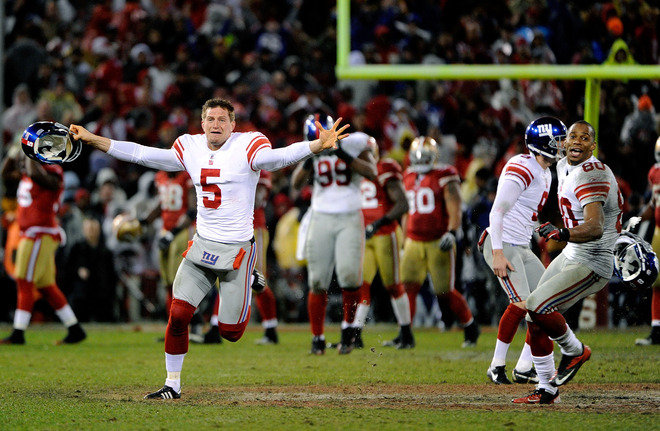 What a tough loss for the 49ers today at the hands, and foot, of the New York Giants. Congratulations to the Giants on making to Super Bowl 46 in Indianapolis to play the New England Patriots, in a rematch of Super Bowl 42. Many things compounded in this game that cost the 49ers the game. Two costly fumbles on special teams, not being able to sustain drives on offense, not converting on third down, are the biggest reasons why the 49ers get to go home instead of to Indianapolis. Alex Smith had a respectable game going 12/26 for 196 yards and two touchdowns, but had trouble getting balls to open receivers when he had the chance. Frank Gore rushed 16 times for 74 yards, and Kendall Hunter added another42 rushing yards. Vernon Davis led the way in the passing game with 3 catches for 112 yards and 2 touchdowns. The team however was a dismal 1-13 on 3rd down, while the Giants converted a third of their own third downs. Eli Manning had a big game, despite being sacked 6 times, he went 32/58 for 316 yards and 2 touchdowns. Ahmad Bradshaw added 74 yards rushing on 20 carries for the Giants, while Victor Cruz had 10 catches for 142 yards. The Giants also ran 90 plays as compared to the 49ers 57. Defensively both teams were very close but the time of possession helped to really wear down the 49ers defense. The Giants had the ball for over 25 minutes in the first half, and while the 49ers came out inspired in the second half, there just wasn’t much left in the tank when the game went into overtime. Both teams were able to pressure on the opposing QB, and didn’t really give up much in the rushing game, but the Giants were able to keep the 49ers receivers in check for the majority of the game. Special teams was were the Giants did their damage, getting two gift fumbles from 49er return man Kyle Williams, one in the 4th quarter on a punt that Williams tried to pull up on but couldn’t get his knee out of the way. The second that helped the Giants win the game in overtime came when Williams went to make a play on a return but did not properly secure the ball and the Giants made him pay by causing him to fumble and give the ball back to the Giants offense. Despite being able to play well the better part of the game the 49er defense just had nothing left to keep the Giants from getting the game winning field goal. 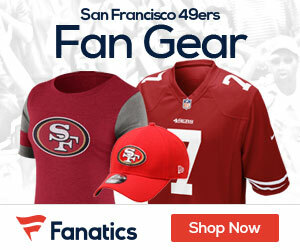 While the way the season ended for the 49ers will sting for a good part of the off season, it was still a great season for the San Francisco 49ers. Jim Harbaugh has brought back the winning culture to the city by the bay, and is the leading candidate for coach of the year. The team is young and should be able to have success for the years ahead and be a playoff regular. So while it’s not the ending any team wants to have, at least it was a fun ride while it lasted, so now it’s just time to look forward to the 2012 season and hope for more success. 2 Comments on "49ers Lose Heartbreaker in NFC Championship to Giants 20-17"
JCJ writes: 49ers first fumble off Williams foot should have been a dead ball the moment NY Giants #15 Devin Thomas touched the ball. The #15 went way out of bounds and came back on the field to make the play, ie pick up the ball and run. He was ineligible to participate in the play once he went out of bounds and the ball should have been whistled dead at the point Thomas touched it. The announcers had to see it in the replay. Just more evidence of how useless the Fox network is. The call on the field was right…the ball hit Williams leg, but Harbaugh should have challenged the call giving the ball to the Giants. If that play was called right, then no Giants touchdown, no overtime, 49ers win. I tweeted same to Troy Aikmen during the extensive replays and reviews but he ignored the data. Typical for Fox network. Any coach that does not have someone outside the stadium watching every game game on TV next year should be fired for incompetence. Just a pro-tip for the bitter jcj above – You are allowed to go out of bounds on a kickoff return and recover the ball if you are not the first to touch the ball after re-establishing yourself in play. Since it bounced off William’s knee(after Thomas was back in bounds), Thomas was second to touch the ball. If it had NOT bounced off William’s knee, it probably would have been a penalty on the Giants. Football 101. Please learn the game rules before you complain that coaches should be fired for incompetence.